Britain’s Labour Party is neck-and-neck with the Conservatives in opinion polls. Surely, many claim, this means that Labour are in trouble, and its leadership is woefully complacent? The Tories are in an utter mess, the argument goes, so if Labour aren’t streets ahead now they never will be. I’m not so sure. The first part of that argument is surely correct. The Conservatives are caught in a conflict between Brexit fundamentalism and reality. Such conflicts, when you are the governing party, bode ill. Government pronouncements are almost comic. Today, for example, David Davis, the Brexit Secretary, raised the prospect of a Mad Max dystopia after Brexit, which we can happily avoid, he suggests, by staying in the EU in all but name. Well that’s how it sounds. But worse, Theresa May is a lacklustre leader, neither able to present an inspiring vision, nor to handle the everyday give and take of networking and negotiation the role requires. The party is shrinking, and it is failing to capture the interest of younger voters, by which I mean under-50s. Its chosen core support base is literally dying. The party is being hollowed out in a way reminiscent of the not dissimilar situation it faced in the mid-1990s under John Major. But then a relaunched Labour Party under Tony Blair established a massive poll lead and then crushed the Conservatives in the election of 1997. So why isn’t today’s Labour Party doing much better than it is? It is reported that the Labour leadership feel confident that they can repeat their performance in last year’s election of a poll surge during the campaign itself. And yet surely the Tories will not run such a dire campaign? They may be running out of activists but they have no shortage of donors. A halfway decent manifesto should mobilise the oldies better, and in a second attempt they can surely create doubts about Labour under Jeremy Corbyn’s leadership. And the voting system is tilted in their favour. What the Conservatives have to play with is Labour’s lurch to the left under Mr Corbyn, and the rapidly growing hold of his supporters, organised by the Momentum movement, over the party. This has awoken traditional fears of Labour – and this seems to be propping up the party’s poll rating, as well as motivating wealthy donors. In the 1990s Mr Blair tacked his party to the centre and wooed Tory backers. He left his opponents with no oxygen; how different is Labour’s strategy now. But I have underestimated Labour’s leadership once (last year), and I don’t want to do it again. Labour retains some key strengths, and the Tories some concealed weaknesses. This will not guarantee Labour victory in the next election, but it will give them a base from which to make a serious challenge. Labour’s first strength is that they are building a solid political coalition of core support. Last week I described an idea that I called “Brixton liberalism”, and how it gave me hope about the future of liberal values. Labour has a stranglehold on Brixton liberals, notwithstanding the party’s distinctly un-liberal instincts. They have seen off two challenges: from the Liberal Democrats, following the period of coalition in 2010 to 2015, and the Greens. The Lib Dems, my party, seem to have retreated to the professional middle classes; they are hoping to win liberal voters from Labour through anti-Brexit feeling. This shows no sign of making headway. The Greens have been almost completely crushed; Labour’s intent to maintain their stranglehold was recently shown by their airing of policies on animal welfare. They are presenting themselves as the Green Party by other means. The Brixton liberal coalition comprises many younger professionals, especially those linked to the public sector, and the new working classes, who are often members of ethnic minorities. A common theme is that these people have been priced out of owning their own property, and have no prospect of secure social housing. It is particularly strong in London. To these can be added trade unionists, who see real hope of extending their influence, through job protection, nationalisation and subsidies for declining industries. How will Labour fare amongst traditional, white working classes, especially outside the cities? These are the Labour heartlands that Mrs May hoped to capture last year, and came closer than many credit to succeeding. But the Tory appeal to this group may have peaked. It is very conservative, and Mrs May was a good standard bearer for that type of conservatism – she might have succeeded if she had offered more to older voters. But her reputation for competence has taken a knock, and any successor is likely to a sharper, more liberal type who will be distrusted by working class voters. We can expect Labour to continue their studied ambiguity on Brexit and immigration, so as not to scare off this group. The second thing going for Labour is that they are doing careful work on their policies. Their critics dismiss Labour’s policies as a throwback to the failed policies of the 1970s. Public ownership of utilities, the roll-back of public-private partnerships of all kinds, free university education, and so on all seem to play to that narrative. But Labour are quietly giving a modern gloss to these policies. They will argue that they developing new models of managing the public sector, and not going back to the bad old days. No doubt they plan to have it both ways – invoking nostalgia for the old days alongside enthusing newer voters. Besides, some of those old ideas don’t look that bad in hindsight: council housing for example. By contrast any new ideas the Conservatives come up with are likely to be more neoliberal fare that will themselves look dated. While South America shows that we should not write off neoliberalsim, it is only likely to make a comeback after voters have experienced a long period of badly implemented socialist policy. And the third thing in Labour’s favour is the diminishing hold of traditional media, which have acted as the Conservatives’ attack dogs for generations. Last year’s election was something of a watershed there. Jeremy Corbyn was their dream target, but they could make no traction. Their current campaign that Mr Corbyn was a cold war spy show that they still haven’t got it. Who cares? And the Conservatives hidden weakness? They are not preparing for the next election in the way that Labour is, or the way that David Cameron did before 2015. Last year’s snap election showed how important such preparation is. Mrs May turned out to be flying blind, without any of the usual preparatory groundwork. Two things are spoiling the outlook for the Conservatives. First is Brexit – it so hard to see how it will play out over the next few years, and therefore what message will work best for the government. Could it be a big anticlimax, defying the Remoaner critics? Could there even be some quick wins, allowing a pro-Brexit counterattack?Or will there be early victims, forcing the Tories to find appropriate scapegoats? And an even bigger problem is the leadership. Mrs May showed herself up as inept in national campaigning, and if anything she has deteriorated since. And yet her party dare not replace her, as each of her rivals shows even deeper flaws. If a new, more dynamic leader should emerge later in the parliament, as many Tories hope, he or she will not have long to pull together an effective campaign, which can take years. And so if the Labour leadership look quietly confident, they have every right to be. What I think Labour needs to do is something like the pledge card Blair had. Home in on four to five priorities and focus on those relentlessly. Failure to do this may leave the myriad pledges looking like a shopping list. As for Lib Dems, you seem to be obsessed with Brexit! This is an issue that the professional middle classes are pre-occupied with, but not the wider population. Some years ago you had quite base in a number of big northern cities, unless LD start speaking to the actual concerns of those areas, often ‘leave’ cities, I cannot see a comeback for you. Thank you. The shopping list approach can sweep in one-issue voters quite effectively – last year’s Labour manifesto did this quite well. I agree about the Lib Dems, but there is a bit of a feedback loop going on, with the party drawing in the anti-Brexit angry brigade, who then shape the message. The party has tried moving on the NHS, for example, but this does not attract much attention. These tactics seem to be less effective than they used to be, especially in reaching out to the younger voters the Tories need. The Cold War and anti IRA lines aren’t as resonant as they used to be, and the reach of these papers is weaker. This particular campaign may even damage the Tories more than Labour is they are clearly pushing some very flaky claims. I have a couple of comments on this interesting post. 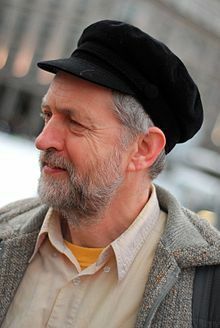 First, the coalition of interests which Corbyn has put together between many younger professionals, the new working classes, and white working class folk from the labour heartlands, is not dissimilar from the coalition that sustained New Labour in power. But in two respects, Corbyn’s position is more precarious than Blaire’s. (1) Blaire drew down reserves of loyalty in the labour heartlands, leaving the white working class folk there feeling disenchanted; so Corbyn is constrained to pay more regard to this group than Blaire was. And (2) the replacement of Labour by a left-of-centre SNP in Scotland implies that he needs greater support in England than previously if Labour is to rule alone. Moreover , his left wing policies imply a clash with the forces of globalisation. All this implies to me that a Corbyn Government would be unlikely to last more than one Parliament. But second, in the here-and-now, I see a further factor in Corbyn’s favour; which is that much of the later phase of the neoliberal project of marketisation/privatisation/contracting out seems to me to have been either intrinsically unwise, or insufficiently skillful in execution. Examples are (a) the PFI initiative may have been sound on the modest scale practised in the later Thatcher years, but its expansion under Blair has taken it into projects which have been fiercely criticised by the National Audit Office in their report last month (b) the privatisation of public utilities which are natural monopolies has come under increasing criticism, as has been detailed recently in the case of water and the railways by two lengthy analyses in the FT (3) the recent Carillion debacle and (4) Lansley’s attempts to introduce further marketisation into the NHS met with much resistance – including from the Lib Dems – and in their watered down form have proved probably not worth the disruption they imposed. So I fear that the likely swing to Corbyn would simply lead to a reaction in another swing rightwards – with each swing imposing disruption costs and public confusion. What a dreary business! I think Labour have done relatively well because they have been honest enough to admit the mistakes of the past. That is they were far too neoliberal and austerity minded. I attended a selection meeting in my constituency and all candidates, even the one who was well to the right of the others, went out of their way to denounce austerity economics. You won’t find any economists, anywhere, who would agree that this was anything other than neoliberalism. Public borrowing obviously hadn’t reached “unsustainable levels”. It was sustained. The idea that there was any possibility that the economy would have been in any condition to “bear cuts” in the very near future was economically illiterate. A neoliberal fantasy. Political dogma in other words! No doubt Vince Cable would argue that some progress was made on controlling the deficit. All that happened was that the burden was shifted from Government to the Private sector as interest rates were lowered to further inflate the bubble in the property market. The total net borrowing in the UK has to equal, by identity, the external deficit. The deficit in the current account caused by our trade imbalance. Nothing was done to address that. The pound was kept deliberately much too high and therefore our exports suffered as a consequence at the same time as we were importing far too much. Well there is an economically literate case to be made to defend the first wave of austerity in 2010 and after, and I made it at the time, though I was about the only one to bother; most defenders of austerity find it much easier to use the illiterate arguments, which have a certain commonsense rationality about them. But you are right that amongst those for whom the abstract ideas of “austerity” and “neoliberal” are red rags, Labour has cleaned up. And amongst this group austerity is seen as the height of stupidity and a failed policy. To most people, though, this is all too abstract and they are confused by the whole argument. Even Labour only rage about “neoliberalism” in groups of the faithful. The macroeconomic pronouncements of McDonnell are very conventional. If you say you wanted ‘austerity’ you are saying you wanted a tighter fiscal policy. That was telling all potential savers that the UK was going to get serious about inflation and therefore it was a good place to park their cash. Those savings increased the Govt deficit. Is that what you wanted too? On the other hand, you would have perhaps supported lower interest rates. This told savers that although the inflation rate was likely to be low they weren’t going to be paid much. This discouraged savers and stopped an influx of foreign money into the UK and so reduced the govt deficit. So two conflicting policies! Of course if you start with the idea that govt deficits are always a bad thing then its easy to get into a muddle. The ability to run a deficit is actually a good thing as it shows a degree of confidence in the economy. Ironically, the way to reduce a deficit, or even to eliminate it, is to destroy that confidence by having inflation running quite a bit higher than interest rates with a combination of loose monetary and fiscal policy. Yikes. This on could run and run. I am thinking of doing a proper post on austerity, even though politically everybody has moved on from the debates post-crash. The debate on the current economy is very different. By austerity I am, yes, focusing on the budget deficit. Actually, only so far as this relates to current spending and taxes. I’m not so fussed about a deficit for investment – though I don’t think investment should be dependent on the business cycle (though after a recession the government may want to find ways of using its borrowing power to lift private investment lending, which can be depressed). The worry is excess aggregate demand in the economy as a whole – though in a modern connected economy the risk of inflation is low, there are other problems with excess demand – asset price inflation and high immigration among them, and, maybe, a sovereign debt crisis. Of course many would say that I must be start staring mad to suggest that there was excess demand in the post-crash economy of the UK. But that is where the substance of an economically literate argument about austerity should be. It’s often claimed that tight government finances lead to an influx of foreign money. But the point about austerity is actually the opposite: to move the terms of trade in favour of the home country so that you can afford to say “no” to foreign support. If that foreign cash leads to more genuine foreign investment, well and good. if it is just property speculation, not so much. I can understand this motivation. So why not do what every other net exporter does and “manage” your own exchange rate to keep it at the right level to give you the trade balance you’d like to see? There’s lots of examples of countries doing that successfully. Denmark, Sweden, Singapore, China etc. Then there’s Germany with the undervalued (for its own economy) euro. Why put the economy through the pain of austerity? When has that ever worked anywhere? I guess I take a more conservative view on exchange rates than you. Absent capital controls (China) it is very hard to manipulate an exchange rate without fiscal policy pushing the same way. When Germany let the fiscal floodgates open in the early 1990s with reunification, their currency shot up too, causing havoc for John Major’s attempt to track it and pushing them into deficit. And I don’t think the level of the Euro is being manipulated. In order for Germany to gain its exchange rate advantage within the zone it had to do it the hard way, by suppressing wages and taking on neoliberal reforms to improve productivity. (The graph of Germany’s real effective exchange rate within the Eurozone compared to the other members is very striking). I’m not sure how Denmark succeeds – but their budget is in balance. In 2010 in my view Britain’s public spending was unsustainably high compared to its tax revenues and I would suggest that in fact it was for the previous 5 years at least. Something had to give or we’d been in for another crash. That’s my thesis anyway. I don’t understand why it is so easy for, say, Denmark but would be so hard for us. Say we decided to have a target of balanced trade. We aim to keep the exchange rate at whatever it takes to achieve this. If we want £1 to equal 1 euro we sell pounds for this price. Then the budget deficit is exactly the same as what everyone else in the UK wants to net save. It has to be by identity. That would almost certainly mean it would be much lower than currently. Fiscal policy, and to a lesser extent monetary policy, is adjusted to set economic activity to the correct level to control inflation but still have some growth. On the macro-economic issues, I would agree that a high exchange rate associated (over time) with a current account deficit encourages high net borrowing in the UK and hence asset price bubbles; it also feeds the regional imbalances which are one of the main causes of public disenchantment with the Establishment. However Vince Cable is widely perceived as having opposed the ‘Osbournomics’ which gave rise to this syndrome in the coalition years; and in his present capacity as Lib Dem party leader he states flatly that the political pressures from owner-occupiers in favour of high house prices have to be resisted in the interests of those trying to buy their first flat/house. So his main ‘baggage’ from the coalition years lies in his role in the tuition fees political mishap. But since his influence was to secure progressive repayment arrangements, could not the Lib Dems advocate a replacement of the unpopular loan repayments by a supplement to income tax paid by all graduates – thus also reducing perceived unfairness between the generations? I have read and reread V Cable’s pretty good book “The Storm”, published before the coalition government, and it is quite candid and reasonable, and it seems to me that his main objection was because rising house prices are both enormously wasteful (they are both purely redistributive and discourage investment in productive assets) and because they make the banking system very fragile. I guess that being concerned with first-time buyers and renters is more of a J Corbyn thing, but it also helps the LibDems in part. it is notable that during the coalition G Osborne run unopposed a policy of faster rising house prices and rents in the south, and was rewarded in the general elections of 2015 with a LibDem wipeout, and a surge of 1m votes, grateful for the riches he had redistributed to them from poorer voters. * Labour had started to tack right with N Kinnock and J Smith well before T Blair had any significant role. If anything it was G Radice with his “Southern Discomfort” pamphlet of 1992 who provided an argument for that, even if T Blair’s LRB article of 1987 contained some of the same arguments. * N Kinnock had improved polls, and J Smith had a massive poll lead well before T Blair had one, and indeed T Blair has a shrinking poll lead wrt to J Smith, his predecessor. * J Major had won a general election in 1992 with a Conservative landslide, and was quite popular as a more centrist, less fanatical conservative than M Thatcher was. * As the 1997 and 2010 elections show english election are not a matter of political positioning, they are referendums on south-east and London property prices. The latter point is critical: J Smith’s large lead in the polls was simply due to the property price crash in the mid-1990, not even to the 1990-1992 recession. Affluent property-owning southern voters simply wanted to “throw the bums out” and they did the same in 2010 for the same reasons. It usually takes 10-15 for an english ex-government party to be forgiven a property price crash by southern voters, and then only if the other party crashes prices too. While a party in power delivers big tax-free work-free property gains the affluent southern voters won’t them against them. New Labour lost 5 million votes between 1997 and 2010, with a veritable collapse in the 2004 local elections and the 2005 general elections, but those votes did not go to the Conservatives, but to abstentions, as affluent voters still remembered the 1990s Conservative property prices crash, and New Labour was still managing to push up property prices in the south in 2005. Southern english voters don’t dare to fire a government that delivers big property gains, even if its leader is as unpopular and toxic as T Blair was after 1997. You don’t have to agree with Tony Blair’s politics to give credit to his political skills. And it sounds as if you are doing some rather desperate myth-making of your own. It is perfectly true that Tony Blair was building on the work of Neil Kinnock and John Smith, as well as the implosion of John Major. But building up a fat poll lead mid-term is very different to delivering a crushing election victory. Mr Kinnock knows that all too well, as does Theresa May. If you haven’t laid the foundation you apparent lead melts like snow on a summer’s day. It’s quite probable the John Smith would have won if he had lived to lead the party into the 1997 election – but I doubt that he would have dealt the Tories anything like the killer blow that Blair did. That contention is unprovable, I admit. What is incontrovertible is that Tony Blair tacked to right and delivered a blow that it took the Tories 3 elections to recover from, and that only after an economic near-catastrophe. How far those two facts are linked is the question. But my memory of the the day-to-day politics in 1996/97 was just what I said in my blog- the Tories were being given no air to breath, and being offered no weapons to beat the Labour with. If the Tories came up with a policy that looked a bit popular, Labour simply said “us too”. And if the Tories started to go “clear blue water”, Labour said: “There you, out of touch.” It was a masterclass in campaigning that I have never seen repeated. But things are very different now.